Brethren has released a StartPack, the link is in the first post. Using it is allowed, as is the importing of small multibrushes (think small templates as opposed to large areas from an unreleased map). However, starting from an abandoned map or importing large areas from other maps is not allowed. Naturally this is on the honor system as we have no way of validating. Naturally this is on the honor system as we have no way of validating. Thank you, Yandros, for answering. Now something can begin to take shape. It is probably just as well. Looking over the Kraken map, it would have taken ages to remove every customized texture and object from it, and it looks so lovely as is. "-patch with TafferPatcher, select Complete Resource Fix Pack and Enhancement Pack (this is REQUIRED. also, skies and water are recommended)"
The enhancement pack contains custom items, doesn't it? Might some instruction be posted as to how to best patch Thief with the latest NewDark/DromEd so as to conform with the rules of the contest? Just install this and you're fine. Or wait for an hour to get a improved version. Last edited by Unna Oertdottir; 25th Mar 2019 at 13:57. Apologies for the confiusion. 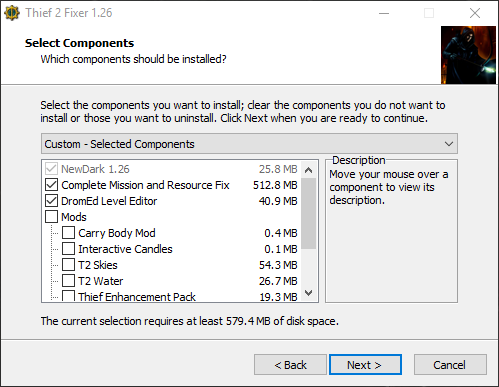 All you would need to do to have the latest version of NewDark and DromEd ready to go would be to run T2Fix and ensure DromEd is selected on the components page. The complete resource fix, also included in T2Fix, is recommended as well, but I am unaware of its legality in this contest. I forgot to check it off for the picture but you get what I mean. I used this for a while too. It's good but recently I noticed I did not have a schema folder anywhere, though maybe it's not supposed to be visible? I remember always having one in the past, but it's been a long time since I actually did an installation from scratch. Are there any plans for a custom (legal) shared resources thread, as with TDP 20? Most likely yes, there's no reason why there shouldn't be one. Really? Heart and Soul was based on an abandoned Sliptip mission that was underdeveloped though fairly sizable. I know that virtually none of the original is visible in the final result, but I don't remember there being a specific rule against abandoned bases. On a side note, it's a complete toss-up whether I'll be able to contribute as an author this time around. I'd definitely like to, but the way my schedule's set, I won't even be able to make an attempt until at least May. Because of school et cetera I would essentially have from May to August to come up with a polished mission. It's not impossible, but I'm sort of inclined to wait until my degree is finished to start Dromeding again properly so that I know I can dedicate time to putting something out. That said, perhaps I'll have a go anyway. I'm still available to do voice-work for all those who may need it though *wink wink, nudge nudge*. And thank everyone else for the invaluable advice. I can't believe everyone here is so nice to me, even though I have never managed to finish a mission of my own. Moved this discussion to its own thread. One of hundreds of similar threads here in the archive. one question ,where did the outerbros things come from ,the three snake circles? what game?